"The Rev. R.M. Chapman, D.D. came to Los Gatos to reside in May 1882. One of the first objects that engaged his attention was to seek out the Episcopalians living in the town and vicinity and to set on foot, with their assistance, regular religious services according to the forms of the Protestant Episcopal Church. His efforts were rewarded with the finding of about a dozen families (including Mr. and Mrs. F. H. McCullagh, Mrs. T.S. Cleland and Mrs. Hoyt, later to be Mrs. E.C. Cole) who belonged to that Church or desired to associate themselves with it. The first service was held in the Presbyterian's house of worship on the afternoon of the Sunday after Ascension, May 21, 1882." "The important matter of a church building in Los Gatos is not without a likelihood of being realized as a lady of the place offered to give a lot and another of Philadelphia has obtained by subscription among her friends $500.00 toward the cost of putting up a small church." "it is hoped that members of our communion in other parts of the diocese will give their aid toward securing for the church a position in the most important place between San Jose and Santa Cruz and which might be made an important missionary center." "The lady of the place" who offered to give the lot was Mrs. J.W. Lyndon. The other "of Philadelphia" was Mrs. Thomas Evans of Germantown, Pennsylvania, who was in Los Gatos visiting her daughter, Mrs. F.H. McCullagh. She was so "impressed by the unattractive surroundings" in which the services were being held, that upon her return to her home parish, St. Luke's in Germantown, she began to raise funds for the church. The people of St. Luke's also sent a full communion service, chancel furniture, a Bible, Prayer Book and Hymnal for the Chancel and Prayer Books and Hymnals for the pews. When the church in Los Gatos was finally built, it was named St. Luke's in appreciation for all that the Germantown group had contributed. Dr. Chapman was busy gathering his people and organizing a Sunday School. The first children in­cluded Jennie Call, Louis Starr, Ora Lyndon and Albert, Kittie and Nellie Hoyt. The records also show that three children who were visiting Mrs. Lewis Hebard of Alma were baptized. These are the first recorded baptisms and took place in Lyn­don Hall. The children were cousins of Mrs. Hebard and their names were Samuel, Theodore and Annie Walker. Dr. Chapman died on April 8, 1883 before his dream could be realized. He was 73 at the time of his death. Following are excerpts from his death notice in the Louisville Courier Journal (Kentucky) of April 25, 1883: "Dr. Chapman was born in Norfolk, Virginia; educated for the ministry at the Theological Seminary in New York, and was ordained by Bishop Griswold in Pittsfield, Mass." This clipping also states that at the time of his death he was living with his daughter, Lucy, and her husband, B.D. Kennedy who had come with him originally to Los Gatos. Dr. Chapman was buried from the M.E. Church in Los Gatos, the officiating clergy being the Rev. George W. Forte, rector of Trinity, San Jose, the Rev. Edward Pidsley, associate priest of Trinity and the Rev. Nealis of San Francisco. Dr. Chapman's grave is located under the present (1901) church building. He was first buried in the old cemetery, but when the original church was finished his body was moved to the vault under it. Following Dr. Chapman's death, a meeting was held on April 30, 1883 at the Odd Fellows Hall and a building committee was organized. Members included Mrs. B.D. Kennedy, Mrs. F.H. McCullagh, J.W. Lyndon and F.H. McCullagh. On May 2, 1883 the committee signed a contract with B.A. Van Dalsen for the church building. Work must have progressed very quickly because on August 26, 1883 a meeting of the congregation was held in the new church, when the Mission was organized under the name of St. Luke's Mission, Los Gatos, with F.H. McCullagh, Warden; J.W. Lyndon, Treasurer; and J .M. Reynolds, Clerk. Fortunately for the congregation at St. Luke's, the Rev. F.B.A. Lewis, M.D. had just arrived in San Jose from Watertown, New York and was persuaded to come and hold services for the new mission "for a few Sundays." "the edifice was duly consecrated to the worship of God. The Rt. Rev. William Ingraham Kip, D.D., Bishop of the Diocese of California acting and being assisted by Dr. Lewis who read the sentence of consecration. The Rev. Edward Pidsley of Trinity Church, San Jose, was also pre­sent and took part in the service." Dr. Lewis was appointed "Missionary at Los Gatos and vicinity" by the Bishop and so continued for more than three years coming from his home in "the Willows" near San Jose for services and visitations. "At a legally called meeting of the congregation, it was unanimously decided that the mission (of St. Luke's) should become a parish. The proper "Declaration" was signed and forwarded to the Bishop for filing. Messrs. John W. Lyndon, James C. Moody, Will S. Mansell, Frank Hansen, H.F. Smith and Dr. S. Grant Moore, were elected Vestrymen, Messrs. Eben C. Farley, Clerk and RG. Allen, Treasurer. At a subsequent meeting of the Vestry, a call was extended to the Rev. F.B.A. Lewis, M.D. to become the rector of the new parish. Mr. John W. Lyndon was appointed Senior Warden and Mr. James C. Moody elected Junior Warden. There are now in the parish 82 communicants, of whom 18 are males. The action of the mission was entirely unanimous, and all appear ready to enter upon their Christian work with renewed energy. Since the opening of the mission three years ago, 32 persons have been baptized and 32 presented for confirmation." In writing about the founding of St. Luke's Church, it soon becomes apparent that the "founding fathers" of St. Luke's and the founders of the town of Los Gatos are much the same. The names that are found among the petitioners for incorporation of Los Gatos in 1887 are also to be found as communicants at St. Luke's. Included are J .H. Pearce, E.E. Place, C.C. Suydam, Dr. R.P. Gober, F.H. McCullagh and Dr. S. Grant Moore. Other names that are found in the early history of both town and church are John Weldon Lyndon, John Cilker, A.E. Wilder, N.E. Beckwith and John J. Stanfield. This shows the exterior of the original St. Luke's Church, which was built in 1883 on the same location where the present church now stands. The notice board reads: "St. Luke's Episcopal Church, F.E.A. Lewis, Rector. Sunday Service 11 A.M. Sunday School 10 A.M. Women's Guild Meeting, Thursdays 2 P.M."
In the History of St. Luke's Church written by Mrs. E.C. Cole in 1890, she has the following to say concerning the "work of the Women's Guild" and what they have accomplished in the way of aiding the finances of the Vestry. "They have furnished surplice and stole for use, bought land valued at $258.00, painted the walls and tinted inside, furnished the seats, fenced the lot, built sheds, paid taxes, insurance and janitor to this present year of 1889." In December of 1889, a new Mason & Hamlin organ was placed in the church building. One of the first organists was Miss Jessie M. Hall (later to be Mrs. Eustace H. Blakey). Since the new organ needed to be pumped, Miss Hall recruited her young brother, Arthur, to do the job for her, according to her daughter, Miss Elizabeth Blakey. An item "considered worthy of record" was the visit to St. Luke's on July 27,1890, of the Rt. Rev. William Ford Nichols, D.D., Bishop of California. This was the first visit of the new Bishop in the Santa Clara Valley. A group of St. Luke's young ladies, perhaps a Sunday School class. Picture was taken approximately 1890. They are left to right in back row: Alva Christman, Edna Potter and Alice DeLong (in swing) and Miss Clara Suydam. In the center, Matty Lemon. Front row: Nina Robershotte (Mrs. Joseph Grimes) and Irma Lyndon (Mrs. James D. Farwell). This shows the original 1883 church decorated for Easter Sunday, 1892. On March 1,1890, Dr. Lewis "placed his resignation in the hands of the Vestry." Dr. Lewis felt that the time had come for the parish to have a resident clergyman (he lived in San Jose). He assured the people that he would "ever have the interest of the parish at heart." The Rev. H. H. Clapham (no relation to a later rector) of Bakersfield became rector in May 1892, officiating for the first time on the First Sunday after Easter in that year. He resigned his rectorate in May 1896 to accept charge of St. James' Mission, San Francisco, holding his last service the First Sunday after Trinity, June 7, 1896. "The record of the parish was uneventful during his tenure of office." While St. Luke's Church was originally founded as a possible �important missionary center," so far as the records show, it has never founded any missions. However, it has been very helpful to two that were founded by others. In September of 1896, a group of Episcopalians in Saratoga held their first service in a newly constructed church "on the corner of St. Charles and Sixth streets, Saratoga." The church was named St. John's and continued as a mission into the late 1930s. The Rev. John Collins and the Rev. David Todd Gillmor of St. Luke's gave their services to St. John's. When St. John's was closed and the property sold, "the faithful few took membership in St. Luke's, Los Gatos." The money from the sale was placed in the Bishop's fund and subsequently used when the present Episcopal Church of St. Andrew's in Saratoga was established. Around this same period, a group of English people living in Patchen, a small community in the Santa Cruz Mountains, also started a small Episcopal mission. The clergy at St. Luke�s helped them. According to Miss Elizabeth Blakey, the Rev. J. Clarke Robbins used to make the trip up to the mission to hold services, and every time he did, the poor man would get poison oak! St. Luke�s on Easter Sunday, 1898. Note the memorial plaque on the right, which was given in memory of the Rev. Robert M. Chapman, first rector of the parish. The Rev. George N. Deyo succeeded Mr. Clapham as rector but he didn't stay long. On September 21, 1898 he resigned to return to New York. The Rev. Albert Enor who came from the Diocese of Oxford, England succeeded him. He too did not stay long but resigned his rectorate on Easter Day, April 15, 1900. The following May, the Vestry decided that the church should return to a mission status for one year. As a result, Bishop Nichols appointed J. Clarke Robbins as Lay Reader as of May 20, 1900. Mr. Robbins was ordained Deacon on October 7, 1900 and priest on July 25, 1901. No mention was made of where Mr. Robbins was ordained. If he was ordained at St. Luke's Church, there is no record of it. Then life for St. Luke's Church and most of Los Gatos was changed very quickly when fire broke out at half-past three o'clock on Sunday morning, October 13, 1901. The church building was completely destroyed but, thanks to the efforts of Mr. Robbins, the following items were saved from the church: the cherry wood font, brass cross, lectern, Bible and the communion vessels. The monetary loss was placed at $2,000.00, according to the local paper. In less than three months following the fire, the foundation was laid for the new church (the present church) on December 16, 1901. The Rev. J. Clarke Robbins and Mr. John W. Lyndon were appointed as the building committee by the Vestry. W. Dolhim of San Francisco was the architect, Hy Hooper the building contractor and the painting contractor was Jack Sullivan. The latter two were Los Gatos businessmen. "Prescott Cookingham is the name of a bright-faced youngster who lives with his parents in Los Gatos, and has been just an ordinary boy during all of his thirteen years. Last week he won local fame by writing a play, stage-managing it, and securing a half dozen other young folks to join him in producing it." and young Prescott came to the front. He said if the Church would provide the costumes, he would do the rest -- leading man, stage-manager and all. Prescott rounded up his playmates, they rehearsed in a barn and their big show, "Among the Rockies," was off and running. According to the program, the cast included, besides Prescott: Garton D. Keyston, Cecil Simon, Holt Cookingham, Raymond Kearney, Harry B. Allen, George Place, Elton Hogg, Hazel Lyndon, and Zephyr LeFevre. The show was a big hit and the CHRONICLE said that �it may be added as an interesting detail, the new church will get its windows." "Mrs. Sullivan married a Mr. Sullivan who had been married before. He had a granddaughter named Gladys Gable. After the marriage, she was adopted by Mr. and Mrs. Sullivan and renamed Gladys Sullivan. Mrs. Sullivan was a very devout Episcopalian and a member of St. Luke's but Mr. Sullivan was a Roman Catholic and attended mass up at the Sacred Heart Novitiate." This picture shows the Gladys Gates, which were given to the parish by the Sullivans soon after the 1901 church was built. When the gates were originally given, they were placed at the entrance to the church. However, after the remodeling in 1971, they were moved to the entrance to the Parish House courtyard. Later they were placed inside the church in the narthex. They have since been removed and are in storage. On Ascension Day, May 23, 1903, the new St. Luke's was consecrated with the Rt. Rev. William Ford Nichols, D.D., Bishop of California presiding. Mr. Robbins stayed at St. Luke's until 1907 when he had to resign because of ill health. The Rev. Dan Lewis then became rector but he was quickly followed by the Rev. Hugh A. Ramsay who came to St. Luke's on January 15, 1908 "at a salary of $85.00 per month." The period from 1908 to 1918 is very sketchy, with only names of rectors available. Their names and dates on which they came and left are: G.A. Jamieson (1909-1911), R. Marshall Harrison, D.D. (1911-1913), Flectcher Cook (1913-1915), Ralph Bray (1915-1916), and H.H. Gillies (1916-1918). On October 15, 1918, the Rev. John A. Collins was appointed as acting rector. Mr. Collins was called to be rector of the parish on September 1, 1920 and stayed with St. Luke's until 1927 when he resigned to join the staff of Grace Cathedral, San Francisco. The Rev. Leland H. Tracy, D.D. came to St. Luke's as rector on May 5, 1927 and stayed until 1930. From the very beginning of St. Luke's, the Women's Guild played a very prominent role. For years, the women had worked hard and long to earn money for a much-needed Parish House. "The Kirmess has danced its unbroken way, like a rollicking child through history's somber page, from so early a date as the fourth century down to tonight. It was, however, born in great dignity, being originally Kirchmesse, which referred to a religious act when a new church was consecrated. It dates back to the consecration of the Jewish Temples. It was introduced into the Christian Church at the time of Constantine the Great." The program goes on to say that it has now "developed into a festival of the people, whose main purpose is amusement." The program was arranged by Miss Dorothy Dickens and consisted of dances from various countries. Reading through the program, it would seem that not only every young person at St. Luke's but also half the town of Los Gatos took part. Among the parish young people are such familiar names as Sue Bell, Nancy Gober, Rita Pearce, Ruth Rigby, Lynda Roberts, Louise Spreckels, George Place, Cecil Dickinson, Clinton Suydam, Clyde Gertridge, Therese Beckwith, Alice Barnes, Roma Roberts, Dorothy Dixon, Alice Moore, and Viola Powell. The notice at the end of the program states that �the ladies of St. Luke's Guild, Los Gatos wish to thank all the merchants of Los Gatos, San Jose and San Francisco who so kindly advertised in this program." Among the more interesting advertisements were Bean Spray Pump Co. (forerunners of FMC), Millinery by Mrs. A.G. Williams, Sherman Clay & Co., The Bank of Los Gatos, Hunt Bros. Company, J .H. Pearce (fancy groceries), H.S. Beckwith, O'Brien's Ice Cream, and Prussia's of San Jose. Such activities must have been very successful financially because in 1912, the Guild's dreams were fulfilled when the new Parish House was dedicated. Met under the church, fine aprons to make. As we aspired quite grandly to a fine, large guild hall. And the stockholders paid up in a way good to behold. In a comfortable, debt-free, and loved Parish House. *The bank referred to was the Union Bank of San Jose, which failed, but the stockholders paid up the debt. The "under the Church" phrase refers to the original church which had a meeting room there. This postcard shows the Parish House as it was built in 1912. The old oak trees still stand in the parish garden. This Parish House still is in use today but has been enlarged and remodeled several times. The original one, which was unchanged until the late 1930's, consisted of a vestibule, one big room with a small stage at one end, a kitchen and a very basic "rest room" (one toilet). The Rev. David Todd Gillmor became rector on February 16, 1930 and stayed with the parish until he was recalled to active duty with the Army at the start of the United States participation in World War II. His time at St. Luke's marked several changes in parish life. It was, of course, the depths of the depression and the parish was hard pressed for funds. However, since people could not do other things because of "hard times", church activities became a more important part of their lives. The Sunday School, which had always existed at St. Luke's, greatly increased in size. The guilds flourished (there were by then two guilds: St. Luke's and St. Margaret's), the senior choir gained new members, a junior choir was formed and a Young Peoples Fellowship (YPF) was organized. Mr. Gillmor was an enthusiastic man with a very outgoing wife and three lively children, all of which breathed new life into the parish. In 1932, the congregation celebrated the 50th anniversary of the founding of St. Luke's with a gala party in the Parish House. Armistice Day became a big event in the parish after Mr. Gillmor arrived. As he was a Captain in the 143rd field artillery, 40th division, the band from this group would visit St. Luke's every year on Armistice Day to play at the service. Before the service, the ladies of the Women�s Relief Corps would hold a "flag furling" ceremony in front of the church while the band played. Then the band would march inside where they played all the hymns for the service. The reader should keep in mind that St. Luke's was even smaller then than it is now; the effect of "Onward Christian Soldiers" played inside the building is something one does not soon forget! Another interesting visitor that came every summer to St. Luke's was the Rt. Rev. Edward Lambe Parsons, Bishop of California. Bishop Parsons had a summer home in Saratoga and had been visiting there every summer for many years. In the days when St. John's was active, he would attend services there but after its closure he always attended St. Luke's. He was very fond of the parish and always said that they had the �singingest congregation in the diocese". He was always a fascination to choir members because he knew all the Psalms by heart and never opened a Prayer Book! One innovation that Mr. Gillmor introduced at St. Luke's was a midnight service on Christmas Eve. This was to become an exciting event for the townspeople of Los Gatos as well as the congregation at St. Luke's. There was no other midnight service held at any town church except St. Mary's Roman Catholic. Mr. Gillmor had a great sense of the dramatic and the Christmas Eve service was no exception. 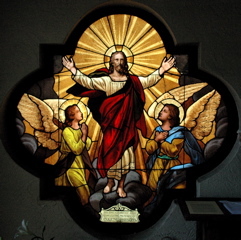 At that time, the window of Christ blessing the children was over the altar. For the midnight service, a spotlight was placed in the Parish House so that it shone directly on the window, and since the rest of the church was in darkness, the effect was impressive! Then just before the service began, acolytes would start lighting candles throughout the church until it was completely lighted with just candles and the light shining through the altar window. The choir then processed with each member carrying a lighted candle. While a modern day fire marshal would no doubt forbid all of this, the effect was very beautiful. In the mid-1930's, a new couple came to St. Luke's from their home in New York and added greatly to the "life and times" of the parish. They were Mr. and Mrs. Fred M. Carter and throughout the rest of their lives they gave generously of their time and wealth to St. Luke's. Their most lasting gift was the Carter Memorial pipe organ, which was given in 1938. Some of its pipes were incorporated into the Visscher organ when it was created in 1992. Another event that took place in 1938 was the death of Francis H. McCullagh, which marked the end of an era for St. Luke's Church. Mr. McCullagh, who died on August 3, 1938 at the age of 84 years, was one of the original founders of the parish and, indeed, it was his wife's mother, Mrs. Thomas Evans, who helped raise money to build the original church. Throughout his life he gave generously to St. Luke's. He gave the original cherry wood font, which was saved from the 1901 fire and then placed in the new church, in memory of his mother. The plaque on the font, read "Mary Cauffman McCullagh August 15, 1819-November 16,1869." It was Mr. McCullagh's custom to lay a small bouquet of flowers by the font on Sunday mornings. Old time parishioners remembered Mr. McCullagh fondly. He was very interested in children and Miss Elizabeth Blakey remembered that he always made a fuss over her and other parish children, and that he had a horse and buggy, which he would tie in the churchyard. When he was older, he was best noted for his ear trumpet! The poor man was very deaf and always carried his ear trumpet, much to the fascination of the parish children. This photo was taken of the interior of the 1901 St. Luke�s building prior to 1940 before any changes were made. This shows the reredos curtain, which was changed for each season to match the other hangings. It also shows the wrought iron chandeliers that were moved to the Parish Hall when the church was remodeled extensively in 1971. In 1941, the Rev. David Todd Gillmor was recalled to active duty as a chaplain in the U.S. Army and took a leave of absence from the parish and the Rev. Stanley Clapham was called to serve as a supply priest. When Mr. Gillmor decided to remain in the Army and therefore to resign his rectorate, Father Clapham was called as rector. Bishop Block (the Rt. Rev. Karl Morgan Block, Bishop of California) felt that someone with independent means should be called to St. Luke's because of it's continuing financial problems and Father Clapham accepted the call. The Rev. Stanley Clapham was born and educated in England. He was married and had a young son, David. He seemed just right for the parish at that time, as there were a great many English people in the congregation. During the War years, there was much activity at St. Luke's. Three services were held every Sunday, the Sunday School greatly increased in size, Guilds flourished and an Altar Guild was organized to take the place of the Daughters of the King. The parish was beginning to need more room, and application was made to the War Production board for authority to expand. This was denied because of material scarcity. By 1952, expansion could wait no longer and took place on a large scale. Two parish offices and five Sunday School classrooms were built onto the rear of the church, with a covered walkway connecting this addition to the parish house. The parish house too was remodeled (some remodeling had been done in the 1930's). A narthex was built and the sanctuary was enlarged. Park, and then in 1957 with the organizing of St. Andrew's Church in Saratoga. Until the organization of these two missions (now active parishes), St. Luke's, Los Gatos had been the only Episcopal parish between Trinity, San Jose and Calvary, Santa Cruz. Of great excitement to the congregation during this period, was the first ordination to be held in the present church building. The Rt. Rev. Karl Morgan Block, Bishop of California, ordained David R. Forbes, son of Col. and Mrs. Francis H. Forbes of Los Gatos, priest at St. Luke�s Church on January 6, 1954. Others taking part in the service were the rector, the Rev. Stanley Clapham and the Rev. Henry B. Thomas. The senior choir, of which David had been a member, with Mrs. Viola M. Gustafson as organist, provided the music. Soloist for the service was his brother, John Forbes. Mr. Forbes was graduated from the Virginia Theological Seminary and, after his ordination, joined the staff at Grace Cathedral, San Francisco. Later he was to be named Canon Headmaster of the Cathedral School and then became Headmaster of St. Paul�s School in Oakland, California. The congregation of St. Luke's was saddened in 1959 by the death of Eleanor Clapham, the rector's wife. In her memory, a mural of St. Luke and St. Mary and the faience work in the sanctuary were dedicated. This was designed and executed by John Gill and given as a token of love by the artist and other parishioners and friends. The murals and other work had to be removed, however, when the church was remodeled in 1971. This photo is of Christmas Eve 1960 showing the new Clapham memorial, which included the murals of St. Luke and St. Mary and the faience work in the sanctuary. After 20 years of faithful service to the congregation of St. Luke's, the Rev. Stanley Clapham announced his intention to retire in 1961. He would remain until a new rector could be called. After a lengthy search, the Rev. Thomas A. Bogard, of St. Stephen's Gilroy was called to be rector. Father Bogard introduced a much more informal air to St. Luke's than had previously existed, although his basic churchmanship was much the same as Father Clapham's. Until Father Clapham became rector, St. Luke's had always been rather "low church," but he introduced more ritual into the service and ultimately discontinued the use of Morning Prayer, with the Eucharist being celebrated at both 8 and 11 o'clock services. Father Bogard continued in this usage. In 1962, with the help of St. Margaret's Auxiliary members, the vestry and other volunteers, the parish house and classrooms were refurbished. And the parish cat, "Gus," moved into the rector's office! Gus was also known to visit the sanctuary during Sunday School services, much to the delight of Junior Choir members. It was during Father Bogard's time at St. Luke's that St. Margaret's was disbanded as a separate group and included with St. Luke's Women's Auxiliary. This greatly reduced the membership as St. Margaret's had always met in the evening, which was best for mothers of young children or working women, and St. Luke's held afternoon meetings. Father Bogard had a great sense of humor and was very popular with the young people. Two boys that he had trained as acolytes were later to become priests. Both young men were "children of the parish" having been both baptized and confirmed at St. Luke's. The first was Lee McInerney, son of Norma Jane (Elliott) and Joseph McInerney. The other was Richard Black Leslie, III, son of Mr. and Mrs. Richard B. Leslie, Jr.
Father Leslie served and later retired as rector of St. James Church, Fremont, California, and served churches in Carmel and elsewhere in retirement. In the Spring of 1964, Father Bogard became ill and resigned as rector. As the vestry felt they wanted to take as much time as needed to find just the right man to replace him there was an interim period of about six months when St. Luke's was served by supply priests, chief among them the Rev. Clarence Lee. Throughout its entire history St. Luke's has been blessed with dedicated assistant priests, most of whom had been non-stipendiary priests. To name but a few, there was the Rev. Fredrick W. Daglish, the Rt. Rev. Louis Childs Sanford (Retired), the Rev. Jack D. Livingston, the Rev. Harry Walrath, the Rev. Robert Moore, the Rev. Charles Bailey, the Rev. Douglas Williams, the Rev. Stuart Schegel, Ph.D., who later became rector of St. Luke�s in his own right. More recent assistants are the Rev. R. Clark Emerson and the Rev. Nayan McNeill, a parishioner since 1961. The Rev. Edward M. Jacobs, D.D., former Dean of All Saints' Cathedral, Milwaukee, Wisconsin, was called to St. Luke's Church as rector in September 1964. He was married and had 4 children, two girls and two boys. He was succeeded in 1985 by Fr. Schegel, and after the interim rectorship of the Rev. Ruth Ellers, the Rev. David Robison Breuer, was called in 1992. Rev. Breuer retired from St. Luke's in 2015. The Rev. Penelope Duckworth served as interim until August 2017, when the present incumbent, the Rev. Ricardo Avila was called and joined St. Luke's in October 2017. The last decades at St. Luke's Church have seen many changes both in the physical buildings and in the makeup of the congregation. Because of the industrial development in the Santa Clara Valley, there was much coming and going of parishioners as people were transferred in and out by their companies. The church building was completely remodeled in 1971-72. The side porch was incorporated into the nave to increase seating and the sanctuary was made much larger. The choir stalls were removed and the organ moved to the back of the church. Most of this construction was made possible by a generous legacy received from the Blanche R. Barnes estate in 1964. Also in 1972, a pre-school was organized with Mrs. C. Jean Pironi as directress and this continued until 1976. The following year the family of Lois Virginia Knowlson gave in memory of her new landscaping for the patio area of the church garden. A plaque with the following inscription is mounted on the garden wall: "Lois Virginia Knowlson 1899-1973." Roy H. Beaton made possible the St. Luke's Columbarium through a gift in memory of his wife, Margaret M. Beaton (1914-1978). This is in the Church garden to the left of the building, and was designed by architect and parishioner Donald Edson. Lois Hazzard gave the large wooden cross in the back garden in 1980 in memory of her husband, Spencer. At the October 1978 Diocesan convention in San Francisco, the delegates voted overwhelmingly to create two dioceses out of the 10-county Episcopal Diocese of California. The new "south" diocese would incorporate most of Santa Clara, Santa Cruz, San Benito, Monterey and San Luis Obispo counties. The new diocese was named EI Camino Real ("King's Highway") and the Rt. Rev. Charles Shannon Mallory was elected Bishop. Bishop Mallory came to his post from Africa where he had been Bishop of Botswana. St. Luke's, Los Gatos, is in Santa Clara County and, therefore, became part of the new diocese. The parish finished its first century with the church still located in the heart of downtown Los Gatos where it began. Because of St. Luke's convenient location, the Parish Hall continues to be used by many outside organizations each week. This is an important part of the parish's local outreach program. Also as part of this program, a St. Luke's Shop was organized in 1980, the proceeds of which went completely to the Navajos at St. Christopher's Mission in Bluff, Utah. Important recent additions to St. Luke's outreach in the community are the St. Luke's Pantry for the Homeless, started in the mid 1980s and which now includes participation from several congregations in the Los Gatos area, as well as support from local service organizations (Rotary, Lions, Interfaith Alliance, etc.). St. Luke's provides staunch support and administrative help for the Santa Maria Urban Ministry in downtown San Jose. Elected to serve the parish for the centennial year of 1982 as wardens and vestry were: Eleanor Vora, senior warden; Donald Edson, junior warden; Keith Fielder, clerk; John Unger, treasurer. Other vestry members are William Buckmaster, Kevin Cole, Jack Eltzroth, Edward Gurnett, Brooks Lupien, William Rikard, George Sutton and Roderick Westmacott. When the church was remodeled in 1971-72, most of the windows from the 1901 church were saved and incorporated into the present church. Moving down the "epistle" side starting at the east end of the nave, the first window is of Christ taking leave of his Mother which was given in memory of Theresa Lyndon. The next is the Dove descending in memory of Abraham Rose. The last window on that side is the "Come Unto Me" window given in memory of Alice S. Moore (mother of Dr. S. Grant Moore) and is dated September 28, 1900. 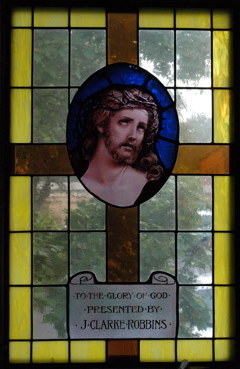 The beautiful west window of Christ was given in memory of Eugene Parsons. It is believed to be a Tiffany design. There is no record of just who he was but Miss Elizabeth Blakey remembered him as a clergyman who came from England. His name does not show as having been a rector of St. Luke's, but he was perhaps a retired priest who was a member of the congregation. The original windows on the "gospel" side of the nave were all removed in 1971 but the first one on the east end was saved and is now in the sacristy. This is of the head of Christ and was in memory of J. Clarke Robbins, rector of the parish 1901-1907. The "Sunday School" window, which had been over the altar, is now on this side. This may be one of the windows purchased after the 1901 fire by proceeds from young Prescott Coolingham's play, Among the Rockies. Two windows were added in the early 1950's and these are now on either side of the chancel. The one on the right side is of St. Michael and was given in memory of Robert Morgan Becker. The one on the left is of Archangel Gabriel. This one is in memory of May C. W. Hostetter. 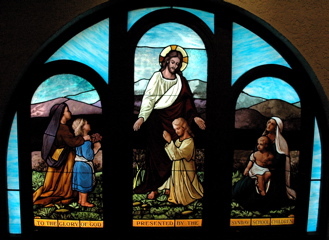 When St. Luke's was remodeled in 1971, two new groups of windows were added on the "gospel" side, created by the Holy City Glass Co. in appreciation for the kindnesses of Fr. Jacobs. At the east end are three grouped together: St. John, the Virgin Mary and St. Luke. 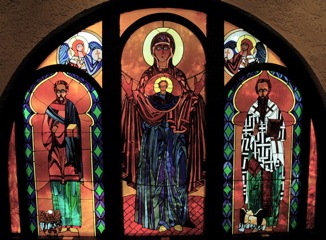 The St. John window is in memory of Rob Reed Goree; the Virgin Mary window was given by members of the parish; the St. Luke window is in memory of George Thompson. At the far west end on the same side is again a group of three. 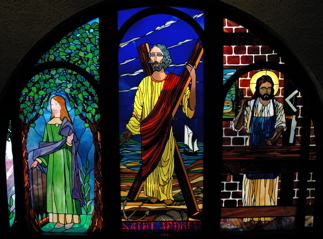 In the center is St. Andrew in memory of Robert Andrew Dougan, and on either side are St. Cecilia and St. Joseph given in memory of Gladys and Cecil Drage. The Holy City Glass Co. is also responsible for the recovery of the large granite baptismal font now in use. During the process of installing the new windows it was found in the dirt underneath the church building and raised by the workers. St. Luke's Sunday School was organized in 1882 as soon as Dr. Chapman began holding services in Los Gatos. Throughout the history of the church, there has always been an active group with the attendance rising and falling with the number of children available in the congregation. The first group consisted of about 8 children but at times through the years it has built to over 150 youngsters. There are no records of very early superintendents but in the late teens and early 1920s, Miss Lucy Moody took charge of the Sunday School during the time when Mr. Collins was rector. "When Mr. Gillmor came to Los Gatos, the Sunday School had but a mere dozen students but now through his efforts, it may boast of sixty. The officers and teachers are as follows: Mr. Gilbert Becker, superintendent; Mr. Richard Leslie, secretary-treasurer; Mrs. Heretage S. Powell, Mrs. W. J. F. Steele, Mr. David Gillmor, Miss Virginia Seely, and Miss Betty Bedford." Mrs. Horace G. (Beatrice) Jones became superintendent after Gilbert Becker and served in that capacity until 1945. During this time, the Sunday School grew and added teachers so that all grades, from nursery to high school, could have separate classes. Since the only available space was the large room of the Parish House, moveable screens were used to divide this area into separate �rooms�. Mrs. Jones was followed as superintendent by Mrs. Hans (Sadie) Neilsen in September 1945. Mrs. Neilsen served until June 1951 when Miss Dorothy Williams assumed this responsibility. When the new Seabury Series was introduced in the early 1950's, the method of electing a chairman each year from the Sunday School faculty was used rather than an appointed superintendent. In 1958, Gene Myrick, a seminarian of the Church Divinity School of the Pacific, was called to direct the Sunday School and other youth activities. In 1960, Dr. William B. West, a philosophy professor at San Jose City College and a member of the parish, was appointed Sunday School director, followed by Celia Lupien and many other dedicated parents and teachers. Since the end of 1981, there has been an active Sunday School with an approximate average of thirty children enrolled. Over the years, they have produced a Christmas Eve family service in the afternoon, with varying special features ranging from a traditional Nativity pageant to inclusive, spontaneous celebrations and masses. Almost from the beginning of activities at St. Luke's, there has been a choir. Among the first organists was Miss Jessie M. Hall, as mentioned earlier in this history. Also serving as an early organist was Miss Lucy Moody, sister of James C. Moody, one of the first vestrymen of the parish. After the new church (the present 1901 church) was built following the fire, various people served as organist and choir director including Mrs. Elizabeth Funke and Mrs. Marguerita Huff. Mr. and Mrs. Arthur Johnson were appointed as choir director and organist respectively in the late 1920's and served until 1932. Following them, Mr. Carl Crichton became choir director and was succeeded by Mrs. McCloud. Mrs. A. R. (Viola) Gustafson became organist in March of 1932. She was appointed choir director the following year. She held both positions until her retirement in 1969. Viola Gustafson was a fine musician with a great love of all kinds of music. She loved to sight read new music even more than to play old favorites. When Fred and Mabel Carter gave the Carter Memorial pipe organ to the parish in 1938, she studied for a time with J. Sidney Lewis, organist at Grace Cathedral. Dr. Lewis played the inaugural recital at St. Luke's when the organ was dedicated on January 16, 1939. This picture of Mrs. A. R. (Viola M.) Gustafson was taken just prior to her retirement in 1969. She served as organist for St. Luke�s Church for 35 years. This is the Senior Choir in a photo taken in 1944. Back row: Robert Thomsen, Fred Berryman, Mrs. Thomsen, Sara Powell, Mildred Linn and Jack Paison. Front row: Charles Davies, Winifred Doolittle Hancock, Viola Gustafson (organist), Florence Laurie, Father Stanley Clapham (Rector) and Richard Jones. Under Mrs. Gustafson's direction, the senior choir grew in numbers and quality and quickly developed an important place in the life of the parish and the beauty of the service. Many of the members joined the choir in their early teens and continued with the group until their own children also became members. After Mrs. Gustafson's retirement, Mrs. Joyce Cayard Baily became organist, and continued until 1983, when Jack Spiker served for a decade. When the church was remodeled in 1971, the choir stalls were eliminated and the choir disbanded. A group of men, known as the Men's Schola, served as cantors for the 10 o'clock service, with R. Dale Horton as its first leader, succeeded by Jack Spiker. A Festival Chorus, directed by Ms. Baily, sang at holiday masses. The current mixed choir was formed in the 1990s, under Mark Bruce and then Richard Coulter. Mr. Bruce later returned to St. Luke�s succeeding Mr. Coulter. When Mrs. Gustafson came to St. Luke's as organist in 1932, there was no junior choir for the Sunday School. But as the Sunday School grew under Mr. Gillmor's enthusiastic direction, a junior choir was formed and Mrs. Gustafson directed it also. She continued to direct the group until 1942 when Sara Powell (Mrs. Bryan Millar) took over as director. At that time, a separate family service was held before the children attended Sunday School classes and the junior choir sang for this service. The choir increased in membership until at one time there were 30 members between the ages of 8 and 12 years. A Christmas pageant had been a tradition for many years at St. Luke's and that was continued. Another highlight of the year was the annual trip to Grace Cathedral for the ingathering of the Mite Boxes after Easter. Junior choirs from each parish in the diocese took part in the service. For St. Luke's youngsters, this afternoon service was always preceded by a fun trip to Golden Gate Park and a picnic lunch. After 16 years as choir director, Mrs. Millar retired in 1958 and Donald McHenry assumed this responsibility with Mrs. Gustafson still serving as organist. The choir continued until the late 1960's when it was discontinued. William Visscher of Santa Cruz constructed in place the tracker action Visscher organ, Opus V, in 1992, using some of the pipes from the 1938 Austin organ. Its building was funded by contributions from the parish. The "Rejoice" bell, from the Verdin Bell Co. in Ohio, was installed in 1996, also from parish contributions to the project. It has honored choristers and servers in the liturgy of the parish since its inception. Recent additions to the music program at St. Luke's have attracted and involved the local community: the Sunset Series of chamber concerts, Evensong and First Sunday concerts, and the Compline service held on the second Sunday of every month. From the very beginning of St. Luke's Church, the women of the congregation have played a very important part. It was a lady (Mrs. Thomas Evans) who helped raise the first funds for building and another (Mrs. J. W. Lyndon) who gave the lot on which to build. The women's guild, named "St. Luke's", has been a sort of "power behind the throne" for almost the entire 100-year history of the parish. It was these dedicated women who raised the money to build the Parish House (the one still in use today) and who, through many difficult times, used their several talents to supplement the meager parish income. In fact, many times it was the St. Luke's Guild "to the rescue" with a garden party, card party or bazaar, that kept the doors open and the bills paid. After 91 years of faithful service to the parish, St. Luke's Guild (which had become the Episcopal Church Women) was disbanded as an organization. From talking with "old timers", it seems that St. Margaret's was originally organized as a young ladies group prior to 1920 but did not continue as such. In the early 1930's, it was re-organized as an evening guild composed for the most part of young working women who could not attend a guild meeting during the afternoon. They were very active in fund raising for the parish and often assisted and cooperated with the "senior" guild in serving parish dinners and other functions. In the 1940s, they took on the role of service guild to the Sunday School and junior choir. Thanks to their hard work, furniture and rooms were painted for the Sunday School and vestments were made for the junior choir. Their Drama Teas with readings by Claire Loftus, smorgasbord luncheons and fashion shows were all well attended by townspeople as well as parish members. In about 1963, St. Margaret's was discontinued as a separate guild and was combined with St. Luke's Auxiliary. One national Episcopal organization, started by women as a missionary fund, is the United Thank Offering -- now an "equal opportunity" outreach arm of the national church. Currently all women of St. Luke's are considered members of the national Episcopal Church Women organization, which meets during the diocesan UTO In-gatherings. ECW connects with the Church Periodical Club and other relief or outreach projects that the diocese or national ECW mounts. St. Luke's has celebrated an annual Women's Tea in recent years, which honors the service of dedicated parishioners. Informal groups include the Dollars and Sense Investment Club. Shortly after the arrival of the Rev. David Todd Gillmor as rector of St. Luke's, a Young People's Fellowship (YPF) was organized in the parish. The group met on Sunday evenings for discussions and social activities. The YPF increased in size steadily and contributed much to parish life. Most of the young people either sang in the choir, were acolytes, or taught Sunday School. "Kitchen crews" for parish functions were usually YPF members. Prior to World War II, annual Diocesan Summer Conferences were held first at Asilomar, then the Presbyterian Conference Grounds at Lake Tahoe and at San Rafael Military Academy for both high school and college age young people. St. Luke's always had several representatives in attendance. The YPF ebbed with the start of the War but came back in force again later. In 1958, with St. Margaret's paying the cost, a seminarian, Gene Myrick of CDSP, was called to direct youth activities. That same year, St. Luke's Church was honored by having one of it's own, Richard Lorraine, elected president of the Diocesan YPF. In the early 1940s, the diocese purchased property at Healdsburg, which was known as the �Bishop�s Ranch", and this was used for conferences. This property is still in use today. In the '60s and '70s, parish youth activities, other than acolytes, became more or less dormant. However, they started to pick up again in the 1980's with Eleanor Vora as coordinator. When the Rev. Ruth Eller was pastoral associate and interim rector, the SLY (St. Luke's Youth) group produced a medieval morality play in the patio, which was much appreciated by the parish audience. Since then the young people of St. Luke's are mainly incorporated in the general liturgical and educational activities of the parish community, with occasional participation in diocesan youth events. The following names were selected as "highlights" from the Register because of their historical connections with either the parish or the Town of Los Gatos. As would be expected, most of the children and adults listed as baptized were also confirmed at the appropriate time. Therefore, this listing will mention just a few that either pertains to parish activities or Los Gatos events. James Camp Moody, one of the first vestrymen, was confirmed in 1885 at the age of 34. Of interest to history buffs, was the confirmation of Laurence Bulmore in 1906. Laurence was the son of Robert R. Bulmore who was superintendent of the New Almaden Quicksilver Mines. After his father's death in 1909, young Laurence and his mother came to live at their ranch on the Los Gatos-Almaden Road where Miss Elizabeth Blakely played with him when they were children. The confirmation class of 1907 included Dr. Robert P. Gober (age 48) who was a family doctor to several generations of Los Gatans. The 1912 group had among its members Ruth Beatrice Rigby, who taught at Los Gatos Grammer School for many years and Sarah Esdale Theresa Shiels (Mrs. Harold J. Stanfield). Levi Asa Farwell's name appears again for his confirmation in 1920. As with the confirmations, only marriages that pertain to parish or town history will be listed. The first wedding held in St. Luke's Church was that of Emma L. Cushing and Louis Judson Starr on November 6, 1884. In 1889, Saidee Alice Hamilton and Charles Christian Suydam were united in marriage. Jessie M. Hall and Eustace H. Blakey were wed on January 3, 1894. Dr. F. W. Knowles, an early Los Gatos physician, was one of the witnesses at the wedding of Rose Rebecca Williams and Hugh Ross Roberts on January 2, 1895. The following marriages took place in the early 1900's: Apri1 30, 1902, Irma L. Lyndon and James D. Farwell; December 30, 1915, Edith W. Flint and George B. Place; Apri1 30, 1916, Emma Stolte and Ralph Vince Garrod; October 14, 1916, Sue Rundle Bell and Sewall Solon Brown. The following burials are just a very few selected from the early registers that reflect names that have appeared earlier as organizers of the parish. *Mr. Edwards was the father of Estelle Grace Edwards who was known to a generation of Los Gatos Grammer School 6th graders as "Mrs. Teall". Over the ensuing years the vital statistics have included a number of baptisms, confirmations, marriages and burials that reflect the slow but steady growth of the congregation to the present level of about 190 "pledging units." Parishioners have also continued to be active in this and surrounding communities, and the parish rolls still contain readily recognizable local names. "During the autumn and winter Dr. Chapman was ill, so he held services in his house. But he never wavered in his desire to see a church built. Later a meeting was held and a building committee appointed and at this meeting Mrs. Robershotte placed a gold piece in my hand and that was the first actual contribution here to St. Luke's. On April 7, 1883, at Dr. Chapman's request, I went to inspect and take measurements of the church at Santa Clara. When I went to report the next day, I found he had been stricken suddenly and he died that afternoon, just forty years ago. His devoted daughter, Mrs. Kennedy, said that almost his greatest desire was that if a church was built he should be laid to rest in a vault under the chancel, where he had hoped to minister to his people. He was buried in the old cemetery, but when the church was finished we moved the body to the vault under it, as he had wished. The little church was built that summer and was very attractive and we had beautiful memorial furniture, which came from New York. This church with nearly all its contents was burned in the fire of 1901. When Bishop Kip consecrated the church on September 23, 1883, everything was completely paid for and I remember having a balance on hand of less than $1.00, which I put in the first offertory taken. The Bishop remarked that it was the only church in the Diocese that was entirely paid for and consecrated at the first regular service. Dr. Chapman was one of the most attractive men I have ever known, with most lovable manners. His late wife was a deaf mute and they had a school in Kentucky for deaf and dumb girls. He was a cultured Christian gentleman of the old school and the inscription on his tablet in the chancel is strikingly appropriate. In preparing this history of St, Luke's Church, Los Gatos, I wrote to the rector of St. Luke's, Germantown to tell him and his congregation that their "namesake" was about to celebrate it's 100th birthday. "the missionary activity of the congregation stands in bold relief". It goes on to say that throughout their history, they have established and supported five missions. While St. Luke's, Los Gatos, is not one of them, we were the beneficiaries of their very generous giving.